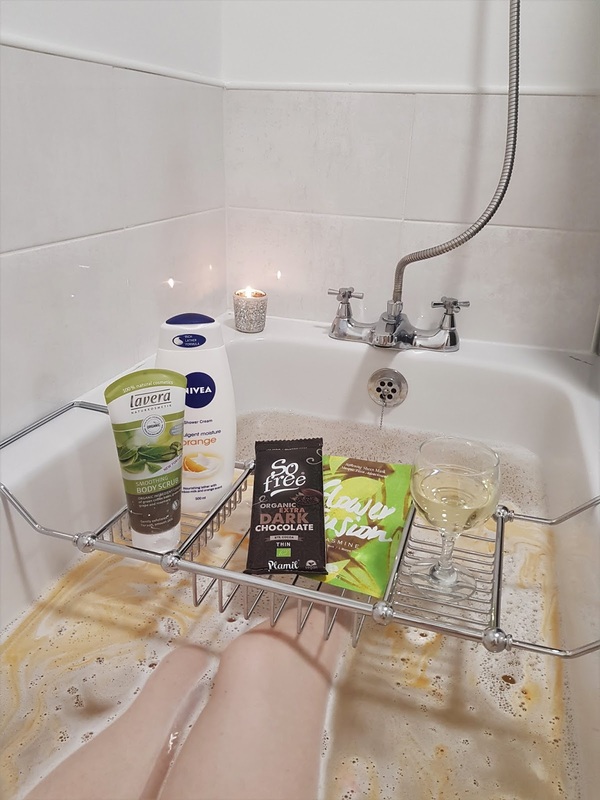 Over the years I've learnt how important it is to take a little 'me time' and I always find that my first instinct, when that time arises, is to run myself a nice hot bath and have a pamper evening. 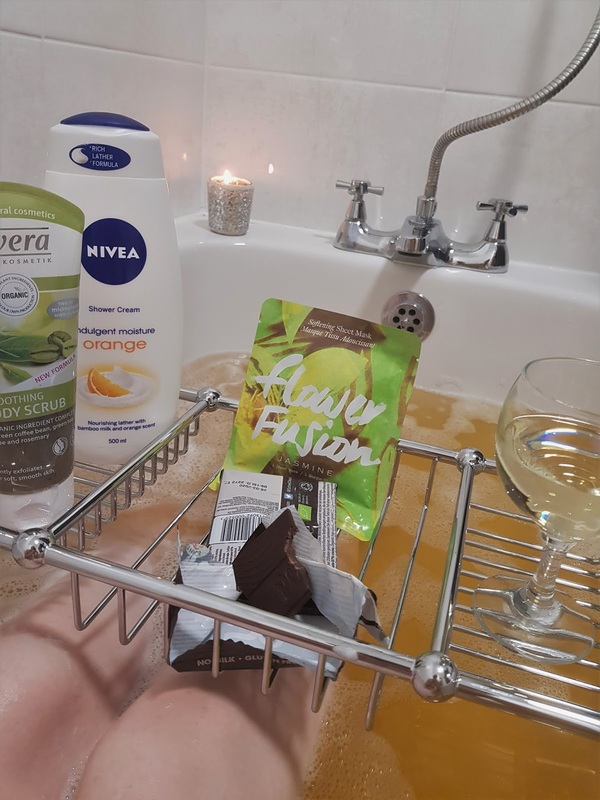 That's exactly why when Sanctuary Bathrooms reached out to me about #GiveYourselfSomeSanctuary I jumped at the chance of receiving a little 'Perfect Night In' box and sharing my 'mental health time' tips. The bathroom is quickly becoming number 1 place for people to find some relaxation and I 100% understand why. 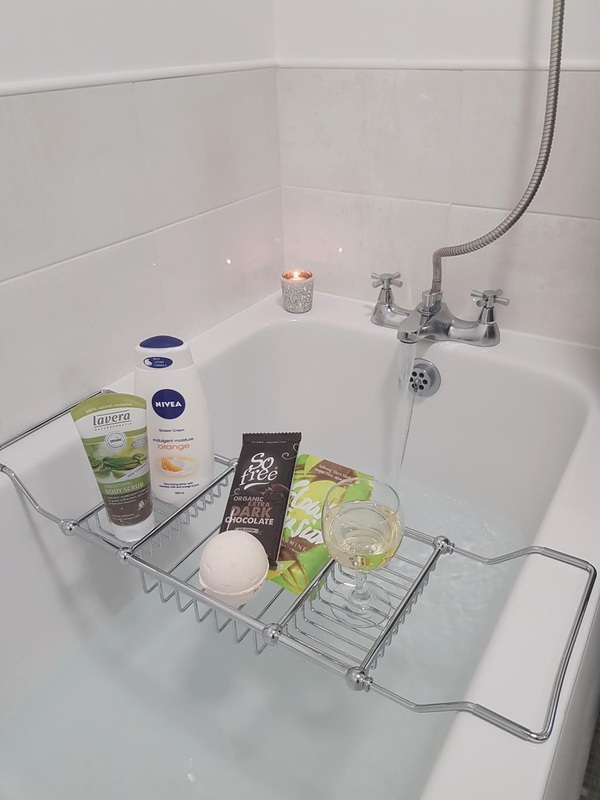 Lock the door, turn the lights out and kick back in a lovely warm bath - try chill out, whether that means closing your eyes and forgetting about everything or distracting your mind with a good book. Whether it's for 10 minutes or an hour, it's so important for you to take some me time every now and then. 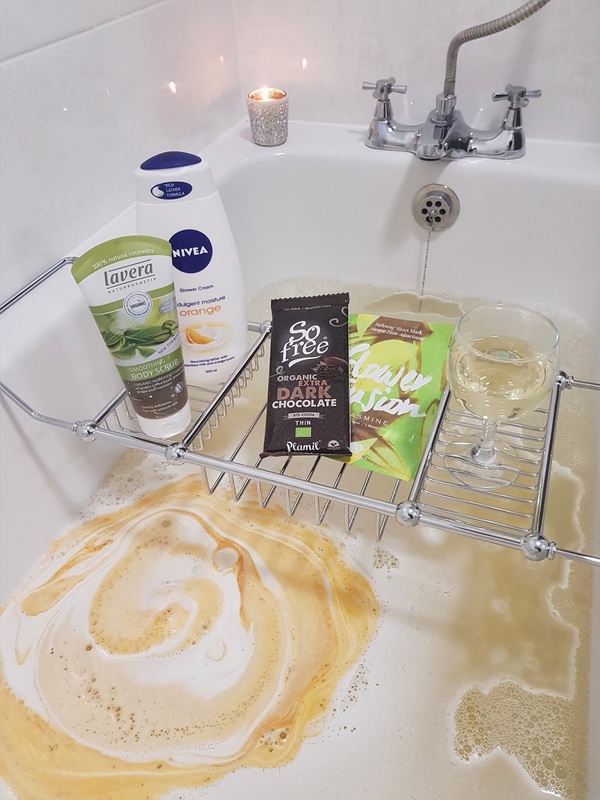 Whether you like a cup of tea and a pot noodle or some prosecco and a bar of chocolate - grab yourself some yummy treats for your little sanctuary as step 1. My treats of choice would probably be a Pink Gin and Lemonade with a bag of Pick&Mix but that doesn't go to say that this chocolate and prosecco didn't go down a treat. Light your favourite candle and run yourself a relaxing bath just how you like it - for me the hotter the better with as many bubbles as possible, not forgetting a bath bomb! 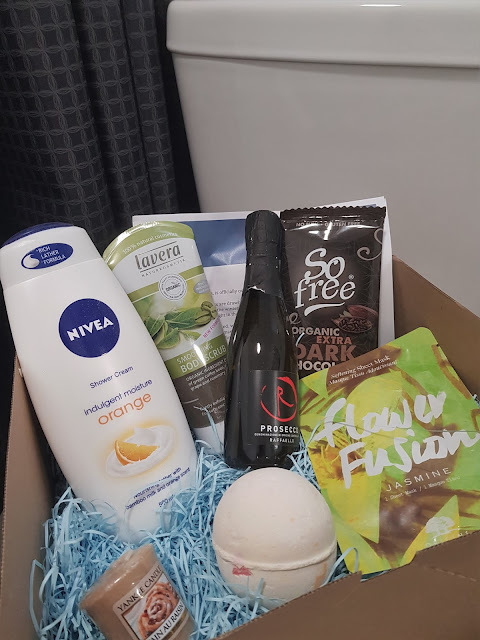 Grab your products of choice and get ready to feel pampered. Here I used a Yankee Candle, a gorgeous Orange Shower Cream by Nivea and a lovely Lavera Body Scrub. Dropping in a Lush bath bomb adds a little something extra too, watching the swirly colours and filling the room with a relaxing scent! Sit back and relax - for me I like to pop on a face mask and lay back (trying not to fall asleep!). 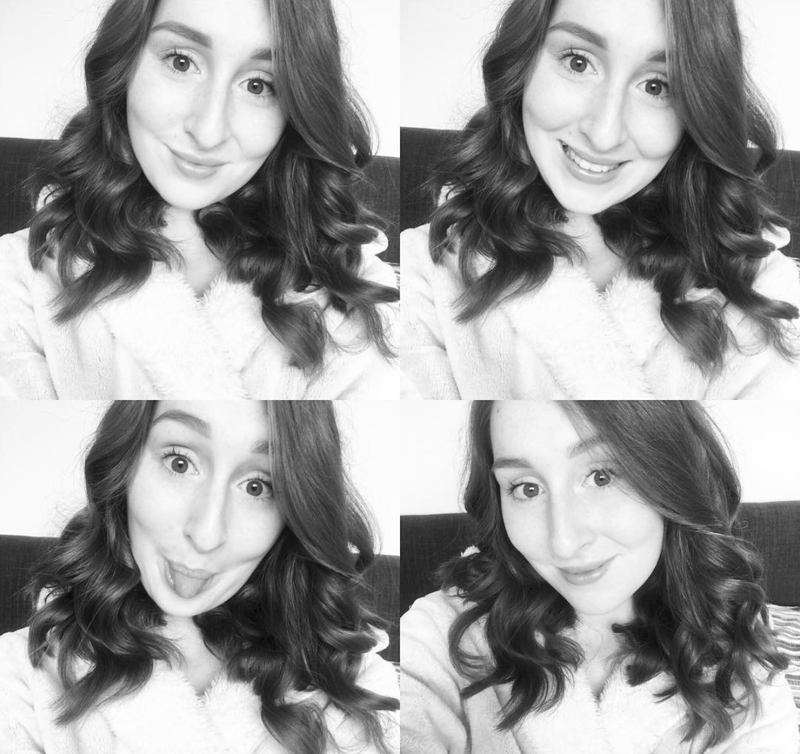 Here I used a lovely Flower Fusion sheet mask from Origins! I've never actually used a sheet mask before and it was so strange but very gentle on the sensitive skin! If kicking back is not for you, grab a book or put on some music - distract your mind and give yourself some sanctuary! Everyone relaxes in their own way - this is my sanctuary, where is yours? Disclaimer: This post is/was in collaboration with Sanctuary Bathrooms who kindly sent me these products with the post in mind. This is not a sponsored post - all opinions and photographs are my own. 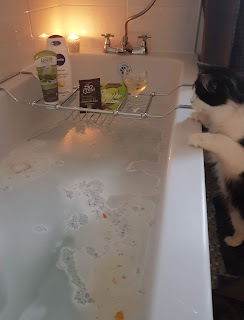 Bonus pic - Lola wanted to some relaxation time too and was pretty jealous of my Sanctuary Bathrooms package.